By Freed Developments, the 36-storey project is only 5-minute walk to 2 LRT Stations. The 8.4 Billion Dollar infrastructure investment, will cut transit time in half along this important mid-town corridor. New light rail transit (LRT) links to 54 local bus routes, three TTC subway stations, GO Transit and Toronto International Airport. Priced at more than $50/sq. ft. below competing projects in the area makes this a great investment. Available condos start in the mid $200,000’s. The project has a total of 470 units. UNIT SIZES From 377 Sq. Ft. To 1500 Sq. Ft.
155 Redpath Condominiums presented by Freed Developments at Redpath and Reohampton in the midtown of City of Toronto. 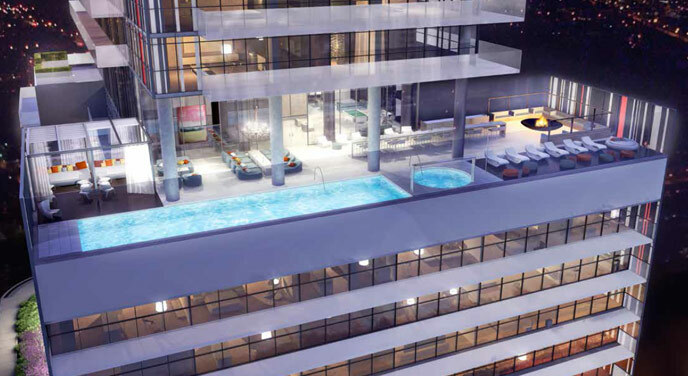 The neighbourhood is attracting professionals who want to eat, play, party and live in the heart of Yonge and Eglinton community. They especially want to be as close as possible to this particular intersection for one very good reason: vibrant, dynamic neighbourhood with well-established shopping, dining and entertainment opportunities. It merely steps to Yonge subway station and future LRT.